What Is 33 Below Ice Cream? 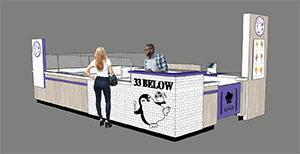 33 Below Ice Cream is a twist on a conventional Ice cream concept. It is called Thai Rolled Ice Cream. Thai Rolled Ice cream is just what it sounds like: little rolls of ice cream, about the size of a roll of quarters, that are packed into a cup, then topped with all manners of extras, such as toasted marshmallow, gummy bears, caramel drizzle, coconut and of course, hot fudge. It is a popular treat in Thailand, Malaysia, Cambodia & the Philippines. For entrepreneurs with a passion for great Ice Cream & retail indulgence with premium malls & amazing locations available across the United States; it’s an opportunity for a whole new lifestyle. The frozen dessert has gained a lot of popularity across the United States & recently made it way into the common areas of the malls. 33 Below Ice Cream is all about creative excellence. 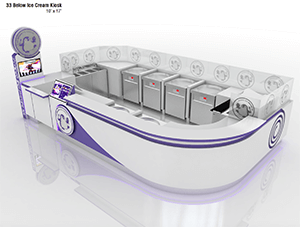 We deliver hand crafted Ice Cream created right in front of the customer! We're looking for owners who are outgoing and have sales, marketing, and/or management experience, and who are results oriented. A person who can build relationships, lead a team, and who has the motivation to excel! You must have a minimum of $60,000 in liquid capital, and be ready to make a full-time commitment. Please call Mike Elessar directly at (917) 843-1316. 33 Below Ice Cream is currently accepting inquiries from the following states: Illinois, New Jersey, New York. Interested parties should have at least $60,000 in liquid capital to invest.